For 10 years we had a met office weather station. Each year I got the monthly average rainfall and temperature. I then calculated the three-year annual average. These figures were single source and uncorrected. My result was of course a spot value and not a global one, but one would expect it to mirror the global figures. It did. From memory, we had an annual increase of 0.01 degrees or 1 degree per century. The last set came to 0.015. Rainfall, OTOH, remained constant at 566mm/year. So yes, temperatures were rising consistently over a very short period but why? This is of course - the question that we all are seeking. The use of inferential statistics isn't new, and isn't unknown in other fields of science. In its most published feat, inferential statistics, along with an expansion of the standard model of the physics of mass predicted the Higgs Boson (god particle) many years before we had the technology to find it. In a less well publicized means, the red shift was postulated long before we had the means to test it, but the modeling for that somewhat preceded the formal inference statistical method, although I'm thinking that plenty of regression was done before publication just as a validation. One of the factors at work in climate that are constantly overlooked is the stadial and interstadial action of our planet, and solar system. Like many things in nature, climate(temps, rainfall, CO2 concentration, etc) will have a periodicity to it, and that period may be measure in decades, centuries, or even million years. The 11 year solar CME cycle has only been validated for maybe the last 50-60 years of study, although we've known about them for a long time. Further, there are often cycles within cycles that further complicates things. Think of an AM radio signal which has a carrier frequency that is fixed, and many varied audio frequencies impressed on the carrier. Just expand this model to a 10 million year span, and take into account all the other planets in orbit, and the sun, and many other factors at work. Now given the example consider that we are trying to 'name that tune' on the AM broadcast by listening to one tone, of maybe three instruments, played for a few milliseconds of time. This is the problem that climate predictors face. To make any kind of prediction of temp over the next 10-40 years by looking only at a small time slice of recent climate is going to produce a lot of gibberish. But - lets say that we can make some predictive statements, and that we can back them up with a slender model. 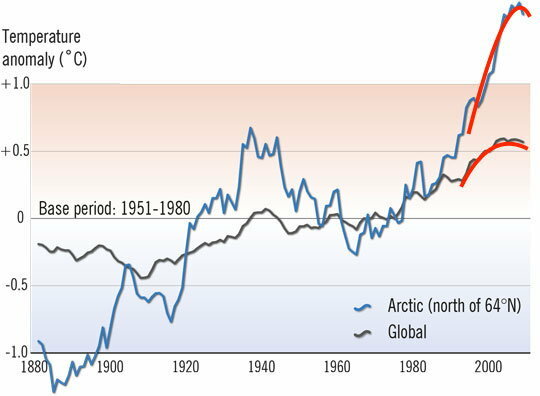 Global mean temps are rising by ~0.0125C/100 years. I will postulate that with a modest R^2 reliability of maybe .75 to .8, which I consider to be as high as I can safely state without actually gathering data, and doing the regression myself. First question - 'is this normal'? Second - 'can the change be accounted for by natural means'? Third - 'if not all of the change cannot be accounted for by natural means, what part(how much of 0.0125/century) is caused by man'? Fourth - 'what cost in terms of human capital, time, effort, finance is it worth re-mediating'? Finally - if we do decide to take some action, how will me measure success? What in the next 20 years would success look like in terms of modification of the observed trend line? What troubles me most about the climate change issue is that most pols, and those who control budgets skip from question 1 all the way to the action phase, and there is no clarity on the rest of the process, particularly quantifying success, except that a lot of climate folks will get their research grants and funding. No one in the climate change community wants to go to the hard and long process of understanding fully. In fact, most of them use the rubric that 'if we wait until we know whats happening, it will be too late to change it. We must change our lives now'. Which is one of the most ridiculous statements to be made by a scientist, or politician ever. It worries me that starting to make wholesale changes in human advancement may have the opposite affect than what the predictions are proposing. I'm not advocating that it will be opposing, but - it could. We just don't have enough solid empirical data, free from bias, and free from selective independence of variability to know. What's worse, is that the political/financial side of all climate research is now tainting some good work being done around the world. The climate change(MMGW) tail is wagging the climate science dog. On my OU course two pieces of evidence were offered. One was the melting snows of Kilimanjaro, the other was a view from space illustrating urban heat island effect in Atlanta. Sadly for the author, the NASA 're evaluated the former to summer snows this negating the evidence. Of Atlanta, I identified the image as taken from 32,000 feet at 2am. I asked a friend in Atlanta to help identify elements in the image. It was possible to see some hotspots and also cool spots of vegetation. There were also unexplained black spots. My friend identified these as shopping malls - cold spots entirely contrary to hea t island. However there was a very wide hot swathe snaking across the image. The author had not commented on this massive heat source. It was t he Mississippi and did not fit the narrative. It was t he Mississippi and did not fit the narrative. I left just before everything at HQ moved to Exeter and was involved in running some of the early climate models so who knows, perhaps our paths met.. I doubt it, I've never worked on any climate-related science. Stupid and ignorant people annoy me. Any thread relating to science on this place is filled with both. Jesus christ. This is the entire problem. "I'm not good at mathematics, but here's why I think leading mathematical experts are wrong, based on some jibber jabber I found on a random website." If all these internet nut jobs were as good as they think then why have they never published their results properly? Engaged in scientific discussion. Could it be because they're talking bollox? I presume the answer will be that the giant cabal (with absolutely no leaks, for the first time ever on any large project) that conspires to mislead the population refuses to let these innocent little lambs publish their ground-shaking results. “Stupid and ignorant people annoy me. Any thread relating to science on this place is filled with both”. Funny old thing, had a lot to say about 'climate-related science' though. And you came across so 'knowledgeable'. Quote: "Jesus christ. This is the entire problem." This is J E T B L A S T !!!! You are clearly the misfit!! Nemy, the person who said "math isn't my forte" did not say that any experts were wrong he/she simply complimented somebody who does know what they were talking about for the clarity of their explanation of statistical calculations. May I politely suggest that you try reading all the post rather than just using bits to suit your own ranting? Seems like real increase of temperatures around the globe, I don't want to enter much discussion if it is solely man made or there are some other factors involved. From this viewpoint it may be that we just wildly dramatise the global warming and trying to stop it is maybe a biggest joke in history. Maybe there is another ice age incoming, funny, isn't it? The problem with all the charts(no disrespect meant here) is where they get their data. If I were to take a line of best fit to the first chart, it would show a dramatic increase from 1880-2000. Thus, we could then use the chi-square and finally the R^2 regression to plot a future increase. But first - one must, without fail trust the raw data used to make up those data points. If one trusts the raw data, and knows that it's accurate and true, then we start making postulates, and theories. Once we have those ironed out we can start with ideas on what to do(if anything) about those theories. Maybe they are best left alone? Maybe we don't want another ice-age and we'll be doing ourselves a favor with a swamp-like environment that supported the largest creatures on Earth. Hmmmm. maybe we should conserve our oil-fired existence? If that is so, whom should be required to give up more? Is everyone on the planet going to be on a carbon diet? How will politicians decide what carbon use is allocated? Do janitors rate the same carbon footprint as doctors? hmmmmm. Last edited by ethicalconundrum; 6th Sep 2018 at 20:03. Pali, you beat me to it! My 'opening comments' were aimed very much at the fact that 'since 1910' is a woefully short period when considering temperatures. (It also doesn't give any information information on the cold winters that we've had, but then that would have spoilt the 'sensationalist' (?) intention of that reporting. The dates that I picked (exactly 1,000 years earlier than the report) were right in the warming years of that Medieval Warming which seem to be universally agreed was warmer than now. Let me quote about that Medieval Period from a BBC publication from the early 1990s: "The climate continued to improve, until in its optimum in the twelfth century it was some two degrees warmer than during the early part of this century." (ISBN 0-563-36058-5, P151) Within 100 years, things were getting wetter and cooler which lasted pretty much through to the early 19th century, when the climate finally started warming again. So we should be planning on how we are going to live with colder wetter conditions than we have now. I was at a meal with two scientists about a week ago where the EU's intention to exclude Britain from the Galileo programme was brought up, with a very direct comment from one of those scientists: "Politicians should be kept away from science matters as they can't get it right, as was shown with Climate Change". Enough said. Politicians will seize upon anything that can be used to scare a population. They will also fund work that achieves the same result. Once you have invented a bogeyman, you can then tax a population and claim it is for their own protection. From the second link, Mt. Shasta, the geographical center of Northern California, has returned to its average temperature of 1900. Last edited by Concours77; 6th Sep 2018 at 22:38. The answer is rather more straightforward. There are plenty of "leaks" such as my earlier comment about selective data models and the links above. This should spark a healthy discussion however the reaction from the usual quarters is to accuse the messenger of being "in denial", usually in the same terms as if they were an idiot denying the holocaust. This crass tactic often proves quite effective in silencing the unbeliever. Consider again that the institutions "studying" climate models rely on government funding. Should the models predict an outcome that does not meet the taxation agenda, that funding would dry up quicker than a chalk stream during a spell of seasonal hot weather. As the scientists are reasonably intelligent, they are generally savvy enough not to be the turkeys that vote for Christmas. Add the lazy media who like nothing more than a sensationalist story for little effort and the whole circus keeps moving forward. Let me give you an example. 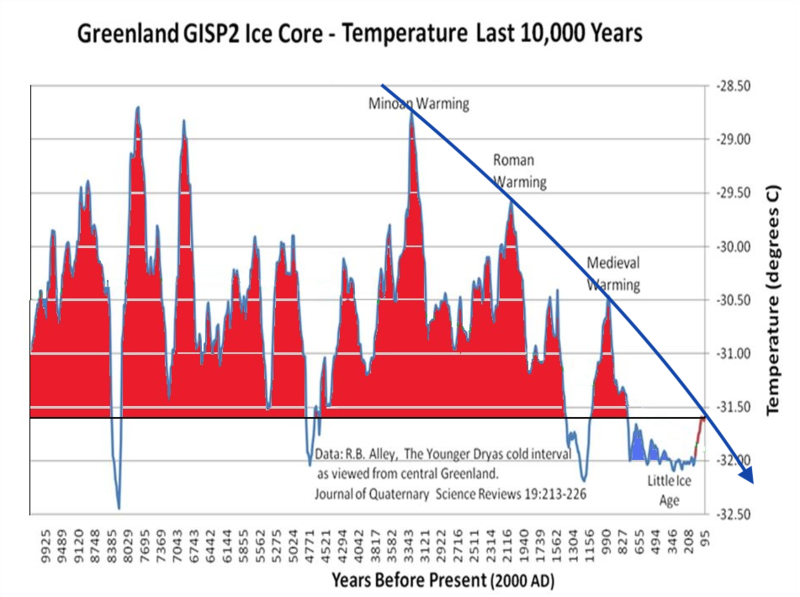 We are still coming out of the last ice age (an inconvenient fact). Northern latitudes were under several miles of ice. That ice was two miles thick in the UK midlands so over scandihooliganland, possible three miles or more. Now that the ice has largely gone, the earth's crust is slowly springing back. My wife's relatives commented that their seaside property now has a garden some 50 meters longer today compared to when they were children. The same phenomena of apparently falling sea levels is being measured around the globe at similar latitudes. We got back to London after that visit and the first headline I saw was that sea levels were rising in Australia. Forgive me but the land of Oz is a bloody big place so they can take a 1cm increase at high tide. Was there any mention of sea levels falling in Scandinavia ? Nope ! In addition, Concours77 comments on "Urban Heat island ignored for too long". In the early 1980s I knew a Canadian meteorologist (who is quite senior in that world now) and asked him about urban influences on weather, specifically the hot surfaces in urban areas triggering tropical thunderstorms while the surrounding areas remained 'CAVOK'. His answer was that this urban effect was real and, on a parallel, all the coldest recorded temperatures in Canadian cities were about a hundred years old as that hundred years had built up a 'warm bubble' around those city met stations with their modern urban development, whereas the more remote weather stations were not reflecting the same big differences from the old recordings that the city weather stations were showing. We get it regularly on BBC Weather Forecasts where winter temperatures are frequently listed with the comment about "and a little colder in rural areas". Birds such as pigeons and starlings tend to roost in urban areas at night as the air temperature is several degrees higher than in open country. The causes include the many sources of warm air such as air conditioning vents and the darkening of surfaces such as concrete, tarmac etc. Those surfaces not only warm up more quickly in daytime but are not cooled by evaporation such as in the case of grassland, crops or woodland. The more urbanisation, the greater the effect. My comments about the long term unreliability of recording sites such as Heathrow, Gatwick and to a slightly lesser extent, Kew are quite valid. The headline yesterday was “Fourth warmest year on record”. Tis September, unused year end monies are looking to be spent. Maybe they calculate based on “Fiscal Year”? eg, June to May? Makes sense for an industry based on squeezing money from the people. Temperature is all about money for the warmers.